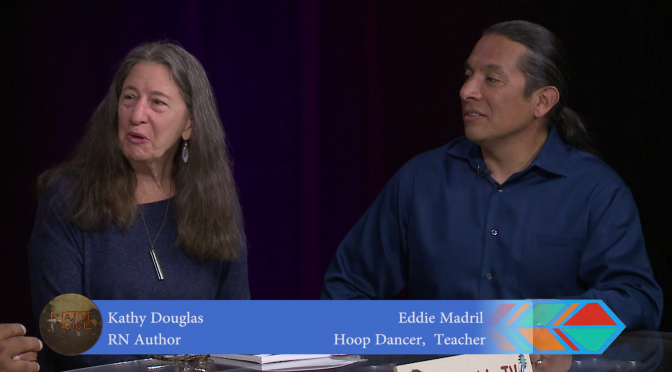 Cihuapilli Rose Amador LeBeau (Host) and Craig Pasqua (Co Host) interviews Kathy Douglas (Registered Nurse) and Eddie Madril (Hoop Dancer) on Native Voice TV. Co-Host, Pasqua asks each of the guests to introduce themselves. Douglas mentions her many years as a ‘Extensive Care Nurse‘, became a ‘Filmaker‘ and recently a book ‘Author‘. Madril has been Hoop Dancing since the late 1970’s, currently teaches at San Francisco State University and College of Marin in ‘American Indian Studies‘ and is co-author (Madril’s wife, Sarah, as a co-writer) of ‘The Dance of Caring‘. This interview is about the origin of the book (Douglas and Madril) – ‘The Dance of Caring‘. They discuss in depth between the connection of Hoop Dancing (Circle) and the Professional Care Giving. “You can not give from an Empty Well”. ‘Care Givers Guide to Harmony’. individual experiences of care giving. Their Own Well Filled and not EMPTY.